Push-Hands is a two-person training method that bridges the gap from Tai Chi forms to combat and self-defense applications. It has been used for centuries to train Chinese warriors. 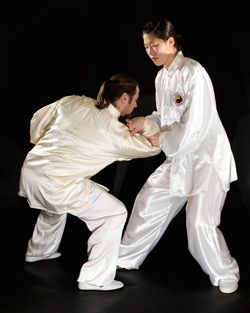 Practicing Chen style Push-Hands is very practical and highly effective training for combat. Not only does it help to improve your strength, endurance, power and agility, but it also trains the sensitivity of your nerves and your brains reaction time when interacting with an opponent. Push-Hands training helps you to develop a higher sense of self-awareness as well as a heightened awareness of your opponent. In this Workshop, Chen Huixian will help you to learn and practice the basic single and double-hand partner exercises of Chen Tai chi Push-Hands.